SOTC pal Christopher R. Weingarten’s Hipster Puppies, filled with pictures of bohemian canines and razor-sharp captions from the man himself, is out, and later this month there will be two events honoring its release: A pageant for pups at PowerHouse Arena on August 25, and a dog-friendly in-store at Sound Fix on August 27. 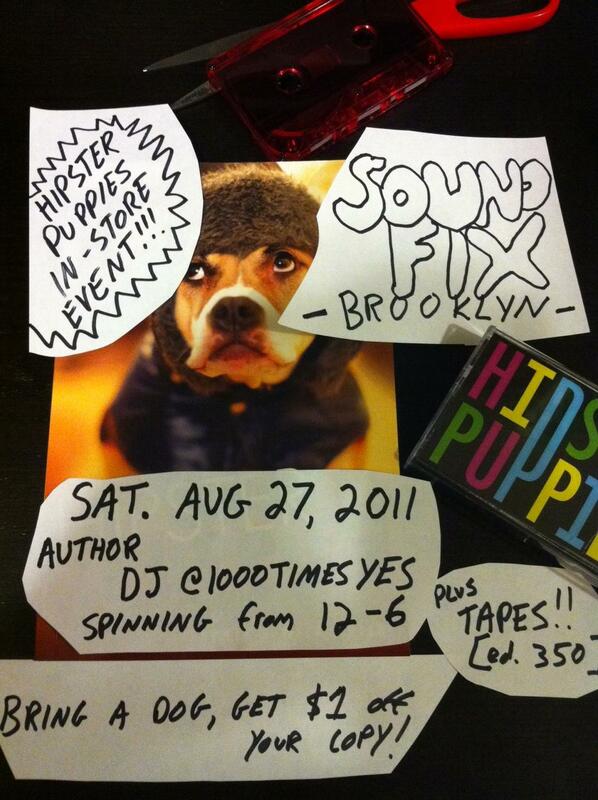 Buy a book at one of those events and you can score yourself a copy of the Hipster Puppies mix tape, which Chris calls “a love letter to New York, as it features a meticulously curated selection of 20 of my favorite local bands.” Given that he’s tipping us off to new local acts every week as our Yes In My Backyard columnist, you know that he didn’t just search “New York” in his iTunes library and call it a day. Full track listing below. And as far as why it’s a tape, and not a mix CD? “Because I’m exasperating Brooklyn hipster slime and everything has to be extra difficult for us or it’s not worth anything, duh.” I think he’s being a bit sarcastic there, though. I think?